Sora are a small short-billed rail, about 8 or 9 inches. They have a distinctive yellow bill. The adult has grey around the eyes and along the sides, and black around the bill and down the throat. 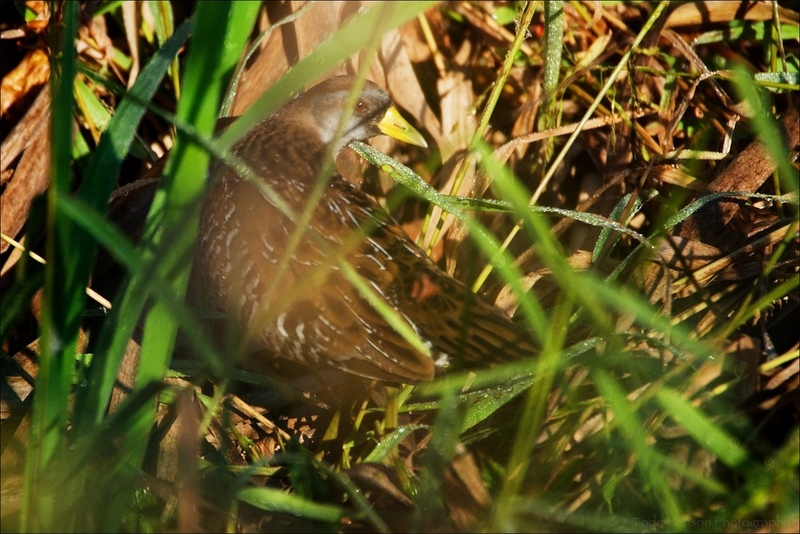 I have only photographed a single Sora. It appeared to be shy and secretive, as most rails do. I was in a wetlands park on the boardwalk and spotted the movement of the yellow bill in the brush about 10-20 feet away. I was lucky to capture a few frames good enough to identify the Sora before it disappeared deeper into the brush.